Magadha and other Mahajanapadas in the Post Vedic period. Expansion of the Magadha state in the 6th-4th centuries BCE. The existence of Magadha is recorded in Vedic texts much earlier in time than 600 BCE. The earliest reference to the Magadha people occurs in the Atharvaveda, where they are found listed along with the Angas, Gandharis and Mujavats. The core of the kingdom was the area of Bihar south of the Ganges; its first capital was Rajagriha (modern day Rajgir), then Pataliputra (modern Patna). Rajagriha was initially known as 'Girivrijja' and later came to be known as so during the reign of Ajatashatru. Magadha expanded to include most of Bihar and Bengal with the conquest of Vajji confederation and Anga, respectively. The kingdom of Magadha eventually came to encompass Bihar, Jharkhand, Orissa, West Bengal, eastern Uttar Pradesh, and the areas that are today the nations of Bangladesh and Nepal. The ancient kingdom of Magadha is heavily mentioned in Jain and Buddhist texts. It is also mentioned in the Ramayana, the Mahabharata and the Puranas. The Mauryan Empire and Gupta Empire, both of which originated in Magadha, saw advancements in ancient India's science, mathematics, astronomy, religion, and philosophy and were considered the Golden Age of India. The Magadha kingdom included republican communities such as the community of Rajakumara. Villages had their own assemblies under their local chiefs called Gramakas. Their administrations were divided into executive, judicial, and military functions. The kingdom of the Magadh, before its expansion, corresponded to the modern districts of Patna, Jehanabad, Nalanda, Aurangabad, Arwal Nawada and Gaya in southern Bihar, and parts of Bengal in the east. It was bounded on the north by the river Ganges, on the east by the river Champa, on the south by the Vindhya Range, and on the west by the Son River. This region of Greater Magadha had a culture and belief system of its own that predated Hinduism. Much of the second urbanisation took place here from c. 500 BCE onwards and it was here that Jainism became strong and Buddhism arose. The importance of Magadha's culture can be seen in that Buddhism, Jainism and Hinduism adopted some of its features, most significantly a belief in rebirth and karmic retribution. King Bimbisara visits the Bamboo Garden (Venuvana) in Rajagriha; artwork from Sanchi. The Magadha state c. 600 BCE, before it expanded from its capital Rajagriha. There is little certain information available on the early rulers of Magadha. The most important sources are the Buddhist Pāli Canon, the Jain Agamas and the Hindu Puranas. Based on these sources, it appears that Magadha was ruled by the Haryanka dynasty for some 200 years, c. 543 to 413 BCE. Gautama Buddha, the founder of Buddhism, lived much of his life in the kingdom of Magadha. He attained enlightenment in Bodh Gaya, gave his first sermon in Sarnath and the first Buddhist council was held in Rajgriha. The Hindu Mahabharata calls Brihadratha the first ruler of Magadha. King Bimbisara of the Haryanka dynasty led an active and expansive policy, conquering the Kingdom of Anga in what is now West Bengal. King Bimbisara was killed by his son, Prince Ajatashatru. King Pasenadi, king of neighbouring Kosala and brother-in-law of King Bimbisara, promptly retook the gift of the Kashi province. Accounts differ slightly as to the cause of King Ajatashatru's war with the Licchavi, an area north of the river Ganges. It appears that Ajatashatru sent a minister to the area who worked for three years to undermine the unity of the Licchavis. To launch his attack across the Ganges River, Ajatashatru built a fort at the town of Pataliputra. Torn by disagreements the Licchavis fought with Ajatashatru. It took fifteen years for Ajatashatru to defeat them. Jain texts tell how Ajatashatru used two new weapons: a catapult, and a covered chariot with swinging mace that has been compared to a modern tank. Pataliputra began to grow as a centre of commerce and became the capital of Magadha after Ajatashatru's death. Nanda Empire, c. 325 BCE. The Haryanka dynasty was overthrown by the Shishunaga dynasty. 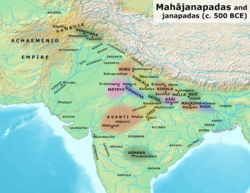 The last Shishunaga ruler, Mahanandin, was assassinated by Mahapadma Nanda in 345 BCE, the first of the so-called "Nine Nandas", i. e. Mahapadma and his eight sons. In 326 BCE, the army of Alexander approached the western boundaries of Magadha. The army, exhausted and frightened at the prospect of facing another giant Indian army at the Ganges, mutinied at the Hyphasis (the modern Beas River) and refused to march further east. Alexander, after the meeting with his officer Coenus, was persuaded that it was better to return and turned south, conquering his way down the Indus to the Ocean. 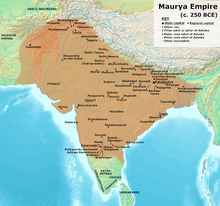 Maurya Empire, c. 250 BCE. Around 321 BCE, the Nanda Dynasty ended and Chandragupta Maurya became the first king of the great Mauryan dynasty and Mauryan Empire with the help of Chanakya. The Empire later extended over most of South Asia under King Ashoka, who was at first known as 'Ashoka the Cruel' but later became a disciple of Buddhism and became known as 'Dharma Ashoka'. Later, the Mauryan Empire ended, as did the Shunga and Khārabēḷa empires, to be replaced by the Gupta Empire. The capital of the Gupta Empire remained Pataliputra in Magadha. Several Śramaṇic movements have existed before the 6th century BCE, and these influenced both the āstika and nāstika traditions of Indian philosophy. The Śramaṇa movement gave rise to diverse range of heterodox beliefs, ranging from accepting or denying the concept of soul, atomism, antinomian ethics, materialism, atheism, agnosticism, fatalism to free will, idealization of extreme asceticism to that of family life, strict ahimsa (non-violence) and vegetarianism to permissibility of violence and meat-eating. Magadha kingdom was the nerve centre of this revolution. 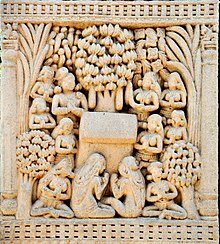 Jainism was revived and re-established after Mahavira, the last and the 24th Tirthankara, synthesised and revived the philosophies and promulgations of the ancient Śramaṇic traditions laid down by the first Jain tirthankara Rishabhanatha millions of years ago.Buddha founded Buddhism which received royal patronage in the kingdom. According to Indologist Johannes Bronkhorst, the culture of Magadha was in some ways different than the Vedic kingdoms of the Indo-Aryans. He argues for a cultural area termed "Greater Magadha", defined as roughly the geographical area in which the Buddha and Mahavira lived and taught. Magadha kingdom coin, c. 430–320 BCE, Karshapana. Magadha kingdom coin, c. 350 BCE, Karshapana. With regard to the Buddha, this area stretched by and large from Śrāvastī, the capital of Kosala, in the north-west to Rājagṛha, the capital of Magadha, in the south-east". According to Bronkhorst “there was indeed a culture of Greater Magadha which remained recognizably distinct from Vedic culture until the time of the grammarian Patañjali (ca. 150 BCE) and beyond”. Vedic texts such as the Satapatha Brahmana demonize the inhabitants of this area as demonic and as speaking a barbarous speech. The Buddhologist Alexander Wynne writes that there is an "overwhelming amount of evidence" to suggest that this rival culture to the Vedic Aryans dominated the eastern Gangetic plain during the early Buddhist period. Orthodox Vedic Brahmins were, therefore, a minority in Magadha during this early period. The Magadhan religions are termed the sramana traditions and include Jainism, Buddhism and Ājīvika. Buddhism and Jainism were the religions promoted by the early Magadhan kings, such as Srenika, Bimbisara and Ajatashatru, and the Nanda Dynasty (345–321 BCE) that followed was mostly Jain. These Sramana religions did not worship the Vedic deities, practised some form of asceticism and meditation (jhana) and tended to construct round burial mounds (called stupas in Buddhism). These religions also sought some type of liberation from the cyclic rounds of rebirth and karmic retribution through spiritual knowledge. Two notable rulers of Magadha were Bimbisara (also known as Shrenika) and his son Ajatashatru (also known as Kunika), who are mentioned in Buddhist and Jain literature as contemporaries of the Buddha and Mahavira. Later, the throne of Magadha was usurped by Mahapadma Nanda, the founder of the Nanda Dynasty (c. 345–321 BCE), which conquered much of north India. 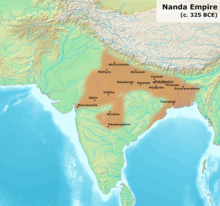 The Nanda Dynasty was overthrown by Chandragupta Maurya, the founder of the Maurya Empire (321–180 BCE). There is much uncertainty about the succession of kings and the precise chronology of Magadha prior to Mahapadma Nanda; the accounts of various ancient texts (all of which were written many centuries later than the era in question) contradict each other on many points. Furthermore, there is a "Long Chronology" and a contrasting "Short Chronology" preferred by some scholars, an issue that is inextricably linked to the uncertain chronology of the Buddha and Mahavira. According to historian John Keay, a proponent of the "Short Chronology," Bimbisara must have been reigning in the late 5th century BCE, and Ajatashatru in the early 4th century BCE. Keay states that there is great uncertainty about the royal succession after Ajatashatru's death, probably because there was a period of "court intrigues and murders," during which "evidently the throne changed hands frequently, perhaps with more than one incumbent claiming to occupy it at the same time" until Mahapadma Nanda was able to secure the throne. A shorter list appears in the Jain tradition, which simply lists Shrenika (Bimbisara), Kunika (Ajatashatru), Udayin, followed by the Nanda Dynasty. Chandragupta Maurya (322 - 297 BCE), founded the Maurya Dynasty. ^ Ramesh Chandra Majumdar (1977). Ancient India. Motilal Banarsidass Publ. ISBN 81-208-0436-8. Raychaudhuri, H.C. (1972). "Political History of Ancient India". Calcutta: University of Calcutta. Law, Bimala Churn (1926). "4. The Magadhas". Ancient Indian Tribes. Lahore: Motilal Banarsidas. Bronkhorst, Johannes (2007). Greater Magadha (PDF). Leiden: Brill and Motilal Banarsidas.